What’s new at Philip Chasen Antiques? recently acquired. Following are a few. Daum is always high on my list of new items. The quality is outstanding and the market is strong. 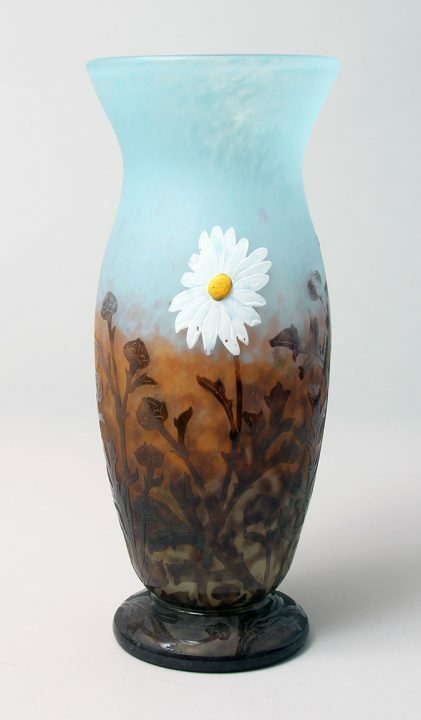 The Daisy vase pictured above is a truly outstanding example of Daum’s best work. Imagine applying molten glass to a vase while it’s being formed. It has to be carefully planned so the flowers come out in the right places. First a gob of white glass was applied, followed by a gob of yellow glass on top of that. After cooling, the gobs of applied glass didn’t look much like flowers, but the carver took care of that. He used a spinning, engraving tool to carve away the excess glass to make beautiful, realistic, 3-dimensional flowers. The resulting Daum vase is outstanding. 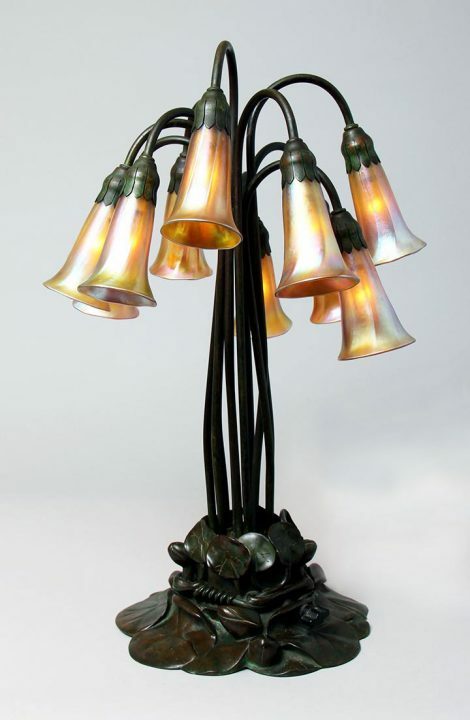 I usually have at least one Tiffany lily lamp for sale at any given time, but I had none for a few months as I sold all that I had. I recently was able to purchase a very fine 10-light lily. What makes one example better than another? Two answers — the quality of the shades and the finish on the base. This lamp excels on both counts. The lily shades are beautiful and extremely well-matched. The original patina on the base is stunning — rich chocolate brown with green highlights. Patina doesn’t get much better than this. Of course all the shades are signed, as well as the base. The porcelain sockets are all original and the lamp has been professionally rewired. It’s one of the finest examples I’ve ever had for sale. Recently I had as many as a dozen different Gallé blownout vases for sale, but slowly but surely that number is dwindling. I now have about six different examples for sale. The example above is the latest, called Rowanberry, part of the rose family. 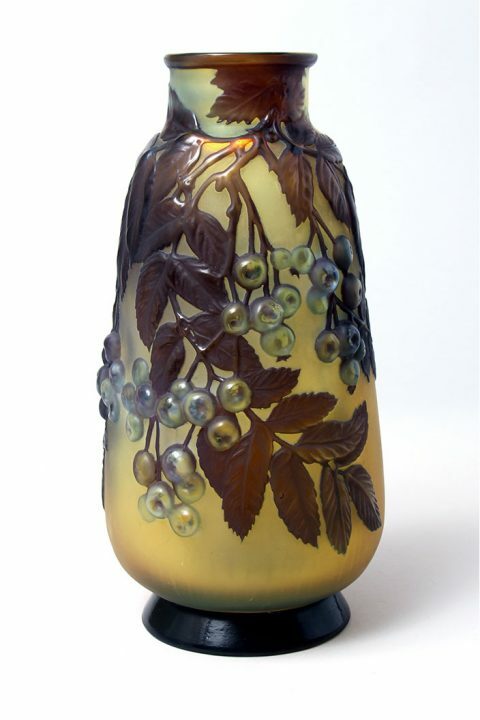 I think Gallé took artistic license with this vase as all the photos I’ve been able to find show the berries as orange or red. Regardless, it’s rare and beautiful, with no grinding (as found on too many examples). I’ll keep working this week to add more items. Keep tuned to my website and don’t forget to email me with any questions. 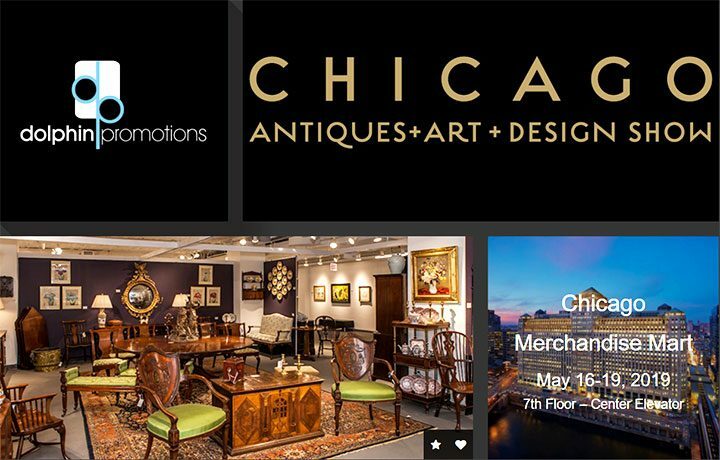 The Chicago Antiques + Art + Design Show at the Chicago Merchandise Mart is fast approaching. May 17, 2019 is only four weeks away. It’s Chicago’s premier antiques event of the year. In the meantime, we’ll be buying up another storm, including a European buying trip we’ve already got scheduled. We’ll bring the new items to the show. Please call or email if you’re looking to buy, sell or trade. We’re always interested. I listed some of the new items on my website and will list more every week. Click Philip Chasen Antiques to take a look. I will make every effort to actively list new items as often as time permits. I always strive to offer the finest objects for sale on my website and at every show. There are many items for sale, sold items with prices and free lessons about glass and lamps. And remember to keep reading my blog. This entry was posted in Auctions by Philip Chasen. Bookmark the permalink.